The minimum bid increment is RM 2. So if you're still interested, the next higher bid has to be RM 30. Congrats leemin. This limited piece of Classic Milky 1951 vintage tee shall be yours for RM 44.
sorry. but i would like to cancel! sorry for the inconvenience! Vinny, since you're the 2nd higher bidder, would you want to take up this item for RM 42 ? Else it will fall to Charmian for RM 40. Do let me know Vinny. Congrats Chong Haw. 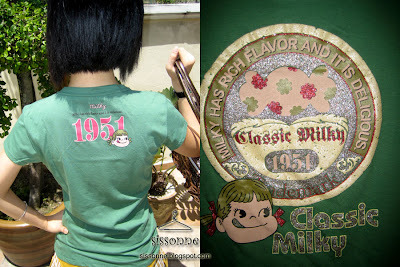 This piece of Classic Milky 1951 vintage tees shall be yours for RM 24.